Discovery had an interesting post about the World’s smallest computer. 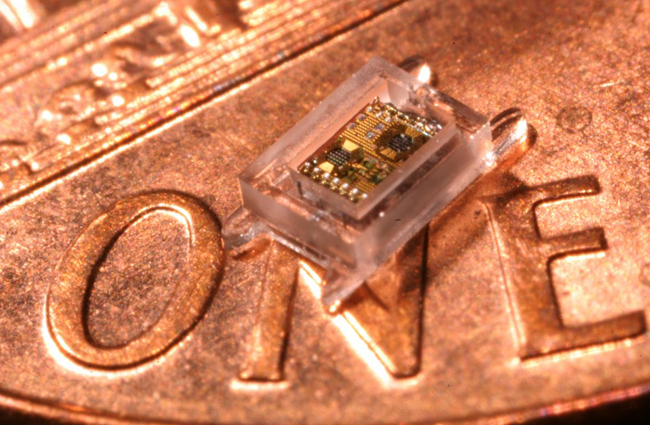 Smaller than a penny, the prototype sensor device was developed by researchers at the University of Michigan. The small chip is intended to monitor eye pressure for glaucoma patients. It actually connects wirelessly with other computers and is charged with a solar cell. It needs just 1.5 hours of sunlight to reach full power. The applications for such mini computers are endless. Some of its other uses are in sensing pollution, structural integrity, tracking and surveillance. Researchers can control the size and shape of the computer’s antenna which will allow it to communicate with a wide range of devices. Check out its enlarged picture. Next The Eye-Controlled Laptop is here!